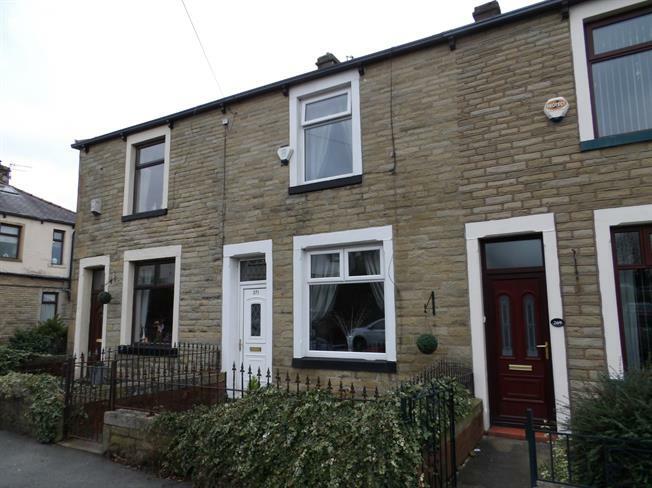 3 Bedroom Terraced House For Sale in Burnley for Offers Over £90,000. This property's price has dropped from £95,000 to Offers Over £90,000. STUNNING THREE BEDROOM MID TERRACE HOME! IDEAL STARTER HOME! Situated on quiet terrace street within walking distance of shops and schools. The property comprises of porch into hall, two reception rooms and newly fitted kitchen to rear. To first floor, two bedrooms and four piece bathroom suite. A further stair case leads to attic bedroom three. To rear enclosed rear yard and access into storage cellar room which offers great potential! Porch into hallway, wood effect flooring, radiator, one ceiling light point and stairs to first floor. Double glazed window to rear, radiator, tv point, understairs storage and one ceiling light point. A range of wall and base units with contemporary work surfaces, electric oven, electric hob and extractor fan, stainless steel sink and drainer, spot lighting, tiled flooring, two double glazed windows to side and rear, wall mounted radiator and back door leading to yard. Double glazed window, radiator, gas fire with surround and one ceiling light point. One ceiling light point and stairs to first floor. Double glazed window, radiator, one ceiling light point and tv point. Corner bath, walk in shower, low level wc, wash hand basin, frosted double glazed window, chrome radiator, tiled to floor, tiled effect flooring. Two velux windows, radiator, tv point and spot lighting. Access from yard, single glazed window and wall mounted boiler.